Is YOUR organization Physician Friendly? A coaching client and I work together to stop the downward spiral and get their energy and attitude back … and yet they continue to spend 10 hours a day in a flagrantly toxic workplace. 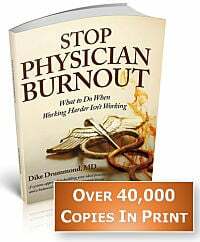 We have to fight the same battle with burnout every day because the conditions at work are not physician friendly. I can help the doctor develop new skills and awareness to become more resilient and balanced … but who has their back at work?? In most cases … no one. It’s every doc for themselves as they run and run and run on their own personal gerbil wheels in their own 3 exam rooms. Feel familiar? What would it look and feel like in a Physician Friendly Organization? That is something I am asked every week. “Dike, are there any organizations that ARE physician friendly and take good care of the doctors?” The good news is there are. The bad news is that physician friendly organizations are few and far between. I have discovered only two in the last 18 months that I would give the “HappyMD badge of approval” to. Grab a pen and a piece of paper. Here are 19 questions to help you calculate your organization’s “Physician Friendly Score “. Take a look at your organization’s Mission Statement. Do the doctors and staff appear in the mission statement in any way? Most organizations fail to acknowledge the existence of the workers who are providing the care – focusing instead on external factors like quality of care or patient satisfaction. 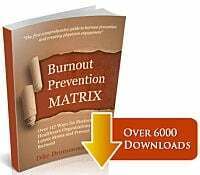 This self awareness blind spot puts everyone in the group at higher risk for burnout. - If the doctors appear in your Mission Statement … is there any mention of their satisfaction or health? Unless the health and satisfaction of the physicians appears in the Mission Statement (assuming your group has one), they are not a priority for your administrators/leaders. - If you do see a phrase supporting physician health in your Mission Statement – does your organization live that philosophy? Is there evidence in the structure or actions of the administration that they are aware of – and actively working to improve – your working conditions, health and satisfaction? - Do you have a standing Physician Wellness / Satisfaction / Health / Burnout Prevention or similar committee? - Does this committee have a budget? - Are they actively in charge of improvement projects in the workplace? Is there a standing agenda item regarding Physician Wellness / Health / Burnout Prevention for the Executive Committee or Board of Directors Meeting? Does senior administration get out of their offices and into the front line clinical settings – clinics, hospital wards, etc.? Are they out talking with doctors and staff, asking questions and using this information to create improvement projects in the facilities? - Or are they like the Unicorn … something you have heard about (and even know its name) but have never seen? Does your group have an active pool of physician leaders in all major committees of the organization? - Or are you managed by non-physician administrators? If you have physician leaders in place, are they paid for their administrative/leadership tasks? - Or do they suffer the double whammy of actually being penalized for choosing to play a leadership role – losing income every hour they spend in important meetings rather than seeing patients? If that has happened in your workplace in the last year, were the results published and have any projects been launched in response to the survey results? Does your organization publicly celebrate accomplishments by physicians and staff? Things such as write ups in your company newsletter and press releases to local media when a wing achieves excellent patient satisfaction scores or a staff member graduates from a training program or someone accomplishes something outside of workplace – such as running a marathon, etc.? Is there an active “suggestion box” system by which physicians and staff can identify problems and solutions and bring them to the attention of management? If there is such a system, is anything done with the ideas or is that where suggestions go to die? Is there a physician peer on-boarding system for new hires? Does a senior partner systematically show them the ropes (at work and in the community) and make sure they get a solid start? - Or does your group just show them how to use the EMR, introduce them to their nurse, open the doors and let the patients in? Does your group have regular, ongoing support / mastermind / Balint groups for physicians who would like to participate. Do you have a “bad outcome outreach team” – a group of physicians who reach out to colleagues who have suffered a bad patient outcome – to quickly and consistently offer support and caring? Is there an anonymous, physician-specific crisis “hotline” doctors can call 24/7 for support … regardless of their reason for doing so? - Does everyone know about this service and the number? - Does that service triage and refer doctors to a reputable group of therapists and other professionals with experience evaluating and coaching physicians? Does your group constantly refine the systems for patient flow, documentation and billing to keep them from causing excessive stress on the doctors and staff? Is your administration aware of how much the systems get in the way of a quality doctor patient interaction and actively working to minimize this interference? Does your organization support part-time and flexible physician work schedules? - Or are schedules rigid and the group’s culture treats anyone less than full time like a second class citizen? Is your organization transparent in communicating the financial health of the organization and the budgeting process? - Or are the numbers and budgets the responsibility of a chosen few who operate behind closed doors? - Do you personally feel that the physician leadership and administration “has my back”? - Do you trust that they are operating in full awareness of your experience at work and consistently in your best interest? - Are you confident they care about you as more than a warm body and a production number? NOTE: A yes on the questions in #19 is a natural result of your group passing a number of the previous questions in the scorecard. When you feel your group “has my back”, that level of trust is a multi-factorial and precious outcome – and a competitive advantage for the groups that create it amongst their doctors. If your score was a positive number … Congratulations! You are working in an enlightened organization that understands the whole business of medicine is constructed on a foundation of healthy doctors. You are in a rare situation indeed. Please contact me and let me know more about your organization. 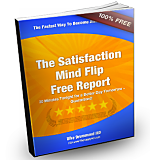 I want to interview you and/or your leadership team to learn the secrets to your success. If your score was a negative number … don’t lose heart. Look at the questions and choose the one item that you think would make the most difference in your organization and contact me here for some suggestions on how you and your leaders can get started. PLEASE LEAVE A COMMENT with your opinion of the questions here on the physician friendly organization scorecard. Keep breathing and have a great rest of your day.